OK, hate is maybe extreme. But I do have a strong dislike for them and more importantly, how completely uneducated our country is on car seats and their safety and purpose. Prams and travel systems are now made with these handy little add ons for mums and dads to attach their car seat to their set of wheels so they don't have to lift their child in and out of a car seat constantly. But WAIT. That means, a baby can stay sitting (and lets just remember that new born babies can't sit unaided... for a reason) in a car seat for potentially hours... you could go and get your shopping done, pop them in the trolley, back into the car, into the house because the little one has fallen asleep and you can just leave them there while you get some jobs done, back out in the car and out to meet a friend. Ok, so that is maybe extreme and hopefully even car seat lovers don't leave their babies in their car seat for that long (presumably during that time they would need a nappy change and maybe a feed... though if it is a bottle you could just do it in the seat...) But hyperboles aside, car seats make it a little easy to allow your baby to sit in a very unnatural position for far to long. I hate to be dramatic, but the risks to your baby can be severe. What are the risks of having an infant in a baby car seat? Plagiocephaly – ‘flat head’ syndrome. Increased reflux – some babies with reflux are better sat up, for other babies the pressure placed on the abdomen, in an upright position, can make reflux much worse. Bradycardia – a slower pulse rate than is typical which can lead to problems with breathing, dizziness, nausea and fatigue. Oxygen desaturation - less air reaches the lungs, which causes lower levels of oxygen in the blood. 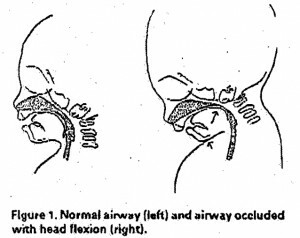 Positional asphyxiation – the baby’s head falls forwards so that the chin is on the chest. This cuts off air flow to the lungs which leads to death. SIDS – Sudden infant death syndrome is where there is an unexplained reason for the death. 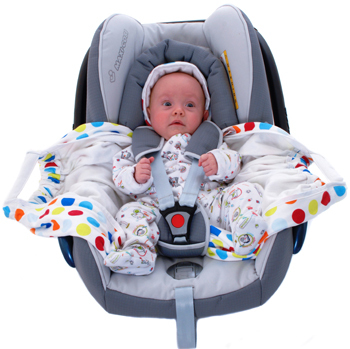 The upright seating position in a car seat could be a contributory factor in an increased number of deaths where babies were not placed on a firm mattress. Limiting the amount of time a baby is asleep in a car seat is a risk factor which could be removed. Restricted growth of internal organs – Babies grow when they are asleep. If a baby is regularly asleep scrunched up in an infant carrier, then their internal organs e.g. lungs will not expand fully and grow. Spine development is inhibited - the continuous curved position of the spine affects vertebral growth. Muscle wastage - the muscles in the baby’s back are not used properly in the curved position. This will affect the long term stability of the back. Motor Skills could be impaired – if the spine and back are not developed properly. After months in the womb, a baby needs the early months, to unfurl, stretch out, and allow optimum growth. Terrifying huh. So before you go and buy those handy little clips so you can pop your maxi cosi (other brands are available) on your wheels. Just think... is it worth risking all of these things? This family talk about dealing with the loss of their child after he was put to sleep in his car seat and found cold and blue a short while later, so preventable and completely down to ignorance. Terrifyingly, this child lost his life at a nursery, where you would hope the staff would be more knowledgable. But really this just harks back to orriginal point, that we are all incredibly ignorant and uneducated on the safety of children in car seats. Now lets be realistic. Car seats are obviously extremely important. It is crucial that they fit your car properly, check when you are trying and buying that this car seat fits well in your car. Not all car seats fit all cars well! 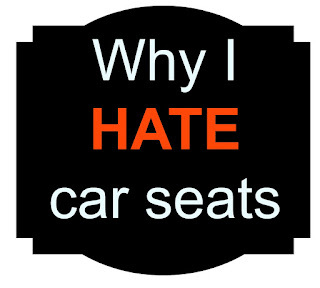 Until I was educated by an extremely helpful and knowledgable car seat expert at Kiddicare I knew nothing of buckle crunch and hadn't given a second thought to how differently shaped car seats are. As far as my research can find, isofix and inertia reel (seatbelt buckled) seats are as safe as one another PROVIDED they are fitted correctly. Maxi Cosi state that an alarming 8 out of 10 car seats are incorrectly fitted by new parents with an inertia reel, so make sure if you choose one like this you are shown exactly how to fit it. So the main benefit of isofix is it is much harder to fit them incorrectly. So, you want to buy a rear facing car seat because you've read it is the safest (I am a fan of the lie flat bassinets - there are only a handful on the market and they pass every test required of a carseat... another post to follow on which I chose and why). If you do get one, get something like this to go with it - a snugglebundl. 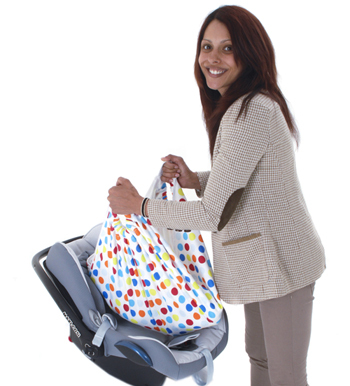 These clever things allow you to lift your child out seamlessly without waking them, you simply place them in the seat before the baby and then when you arrive at your destination you can lift them out using the blanket without manhandling them, and place them in a lie flat position. Magic. A real pet peeve of mine is seeing babies strapped in the front of the car, with parents giving the statement that they can check on them more easily. This is nonsense and it is distracting and potentially dangerous. Get a mirror that fits to your back seats and position it so you can glance at the baby, if you are concerned for their well being... pull over and get out. If for some reason you really need to strap your baby in the front seat of your car ensure your airbag is turned off. This goes for all children sitting in the front. Most cars have a little switch somewhere (often the door hinge) to turn off the passenger airbag, if you were to crash the airbag has the potential to crush and suffocate your child. Be knowledgable on your car seat, don't choose one that is trendy or cool, choose one that is safe and fits your car. Don't leave your baby in their car seat longer than is absolutely necessary (i.e. the length of a car journey). Car seats are not prams. Lying flat is ALWAYS best for babies. we offer complete business and individual solution to get famous on Instagram. buy Instagram followers and like Buy Real Active Instagram Followers at low priceand delivered less than 24 hours. Forum de discussions sur la forum musculation femme en salle ou à la maison sans dopage, pour homme et femme. Real estate curacao. Dushi Homes heet u en uw familie en vrienden welkom op het prachtige, kleurrijke en tropische Curacao. Wanneer u ervoor kiest om een van onze appartementen, huizen of villas te kopen of huren gaat u genieten van het caribische en zonnige eiland. Curacao heeft veel te bieden.